3.25.3 releases of Builder, jsonrpc-glib, libdazzle, and template-glib. Features that the UI redesign depends on have landed in libdazzle. This includes animated widget transitions and more. Builder’s Flatpak of Stable and Nightly channels now bundle OSTree 2017.7 and Flatpak 0.9.6 which should improve situations where we were failing to load summary files from the host. A painful bug where Builder (Nightly Flatpak channel) would crash when launched from the Activities menu was fixed. This was a race condition that seemed to not happen when run from the command line. After some manual debugging the issue was fixed. To simplify future debugging, we’ve added a “Bug Buddy” like feature. If you remember bug-buddy, you’re old like me. If Builder receives a SIGSEGV, we try to fork()/exec() an instance of gdb to inspect our process. It will dump a lot of useful information for us like where files are mapped in memory, instruction pointer addresses, and any callstack that can be discovered. Libdazzle gained some new action muxer helpers to clean up action visibility. The new editor (perspective, grid, columns, and view) design will help us drastically simplify some of Builder’s code. But this also needs forward-porting a bunch of plugins to the new design. The new libdazzle based menu joiner landed to help us integrate contextual menus based on file content-type as GMenu does not support “conditionals” when displaying menus. meson test should work again for running Builder’s unit tests under the Meson build system. Anoop blogged about his work to add a code indexer to Builder here. Lucie blogged about her work to make documentation easily accessible while you code here. Umang blogged about his work to improve our word completion engine here. You can do some pretty flashy things with Dazzle. Tonight I added the missing pieces to be able to make widgets look like they transition between parents. The following is a video of moving a GtkTextView from one GtkStack to another and flying between those containers. Compare this to GtkStack transitions that can only transition between their children, not their ancestors. Fun! There really is a lot of code in libdazzle already. So occasionally it makes sense to spotlight some things you might be interested in using. Today, while working on various Builder redesigns, I got frustrated with a common downfall of GAction as used in Gtk applications. Say you have a UI split up into two sections: A Header Bar and Content Area. Very typical of a window. But it’s also very typical of an editor where you have the code editor below widgetry describing and performing actions on that view. The way the GtkActionMuxer works is by following the widget hierarchy to resolve GActions. Since the HeaderBar is a sibling to the content area (and not a direct ancestor) you cannot activate those actions. It would be nice for the muxer to gain more complex support, but until then… Dazzle. It does what most of us do already, copy the action groups between widgets so they can be activated. The number of times I’ve been asked if Gtk has a GtkPaned that can have multiple handles is pretty high. So last year, while working on Builder’s panel engine, I made one. It also gained some new features this week as part of our Builder redesign. It knows how to handle minimum sizes, natural sizes, expanding, dragging, and lots of other tricky bits. There are lots of really annoying bits about GtkPaned from it’s early days that make it a pain when dealing with window resizes. MultiPaned tries to address many of those and do the right thing by default. It should be strictly a step up from using GtkPaned of GtkPaned of GtkPaned. If you find yourself needing to troubleshoot Builder (hopefully just during our development cycles) you can now run the command “counters” from the command bar (Ctrl+Enter). This gives you access to some internal counters. You can get these out of process too, using dazzle-list-counters PID which cracks open the shared memory page and dumps the counters. As you might imagine, the counters are in libdazzle now so you can have the same sort of feature in your (C-based) applications quite easily. The other day, Sri asked me for a quick Gtk example for a talk. Basically he just needed a window with a header bar. So I put together this repo on github with some examples in a variety of languages. After a few contributions from our community, we have even more examples. I think it would be neat if people submitted pull requests for more languages. Take a peek and see if something you know about is missing. Ideally the example should use GtkApplication, Gtk templates (and resources if possible), and a window with a header bar. Having these available will make it easier for me to make templates in Builder for more exotic languages. Now that gtk-doc is getting updates and integration with Meson, I decided to give it another shot. So here is some work-in-progress documentation for libdazzle, template-glib, and jsonrpc-glib. There is plenty of work to do, but this makes it easier for others to come along and help me do the hard part, the documentation. I’m sort of impressed, in hindsight, at the staggering amount of things we’ve built around Builder in the last couple of years. 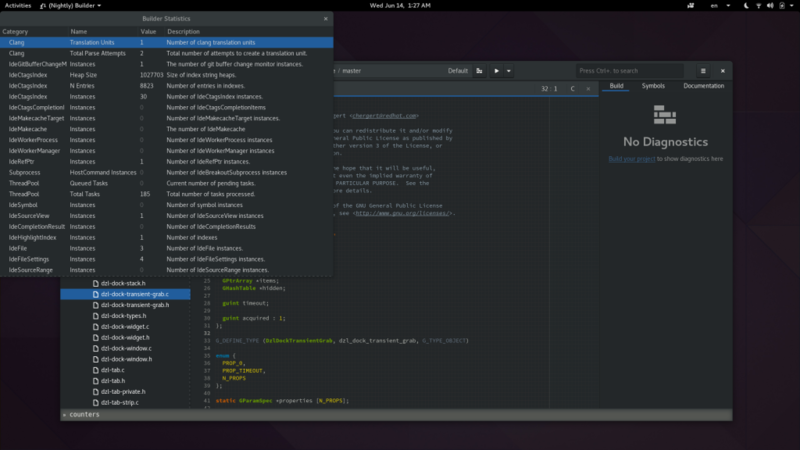 Given the success of this pattern of project-related updates in Gtk, maybe we can try to do this for Builder too. We’ve had lots of updates this past week in Builder and related projects. Builder has switched to meson for building Builder. Autotools has been removed. This does NOT affect build systems supported by Builder. Non-builder related widgets and utilities have moved into libdazzle. Roughly 50k fewer lines of code in Builder. template-glib and jsonrpc-glib are now external projects. Our meson-based build system will automatically install them if necessary. libdazzle’s DzlApplication now handles theme loading, menu merging, and icon loading. It also simplifies widget theming for non-Adwaita themes. Builder’s panel engine was revamped and moved to libdazzle. Various CSS fallbacks were added, including Arc theme. New releases (3.25.2) of gnome-builder, template-glib, jsonrpc-glib, and libdazzle. Builder has switched to DzlSuggestionEntry for search. This design is not final by any means, so I expect further changes. libdazzle’s fuzzy search has been vastly improved, while keeping overhead low. Lots of widgets have been moved into libdazzle. DzlThreeGrid — This is a three-column layout (with centered column) and rows. Menu merging — Automatic menus.ui merging and management, handy for plugins. MultiPaned — No more nested GtkPaned, deals with resizing, expanding, min and natural sizes appropriately. RadioBox — Fancy joined buttons that act like radio boxes. Easily extendable for dynamic content. Progress Buttons — Both GNOME Software and Epiphany style animated download buttons. Chromium and Firefox web-browser style auto-completion. Lazy Tree Builders — These really simplify building large tree views with dynamic content. Lots of utilities, data structures, and miscellaneous library glue. A whole bunch of tests have been added to libdazzle. More are always needed. If you’d like to help with the development of Builder or any of it’s associated libraries, come join us in #gnome-builder on irc.gnome.org.